This is the first posted version of an industry insight document curated for companies in the BBA Aviation organization. We are calling it “Air Intel, powered by Dallas Airmotive.” It is a collection of recent news and information gathered from industry experts and publications, sprinkled with commentary and discussion points in areas of interest for decision makers throughout our organization. There is a lot of useful information here and we thought it might be of interest to a wider audience. We try to gather the information and get it distributed every two weeks. So take some time to peruse our Air Intel, and make sure to check back for more. Highlights of market announcements and activity for the first two weeks of June 2015. ROIC (return on invested capital) is expected to average 7.5% exceeding for the first time the industry cost of capital which has fallen to 6.8%. This average, however, is dominated by US airlines which have benefitted most from falling fuel prices, strong local economy, and industry restructuring. 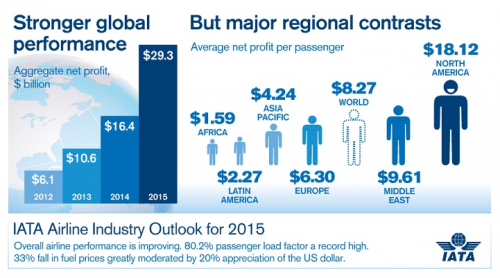 The average non-US airline is still struggling with returns below the cost of capital and significant debt burden. More than half the global profits ($15.7 bn) to come from North American airlines with EBIT in North America expected to exceed 12% more than double that of the next best performing regions of Asia-Pacific and Europe. North American region performs best with 7.5% net post-tax profit margin. Africa weakest at 0.8%. The graphic below summarizes the forecast. Infrastructure – could be most harmful to some of the regions experiencing the highest growth in demand and new aircraft orders, i.e. China, India and Latin America. Airline CEOs point to inadequate infrastructure due to insufficient funding, limited political alignment and concerns over environmental impact. Fuel prices – near term the airlines will spend as much as $70 million less on fuel than in 2014 but there is little to prevent prices from returning to previous highs at some point. Airlines need to develop effective fuel price volatility programs now and put in place for future events. New talent – Industry is predicted to need around 2.7 million additional employees by 2025. Aircraft maintenance technicians are among the most sought after employees. PwC’s poll of airline CEOs shows 75% of them plan to invest in talent management strategies and capabilities over the next year. 5. Airbus (@Airbus) has stated that its A320 production rate could go as high as 60 aircraft per month by 2018 given its current backlog. The airframer is already committed to a rate of 50 per month by 2016. Chief among the concerns is the ability of engine OEMs – CFM and PW – to meet the increased production rate given the new technology in the Leap-1A and PW1100G powerplants, as well as the ability of second- and third-tier suppliers to provide components. 6. Per Reuters, United Technologies Corp's (UTX.N, @UTC) board of directors is scheduled to meet this week to review options for its $8 billion Sikorsky (@Sikorsky) aircraft business after receiving offers for it. UTC is considering two potential tax-efficient transactions for Sikorsky: either a spin-off or a combination with peer Textron Inc. (TXT.N), which submitted an offer for Sikorsky earlier this month. The merger between Textron and Sikorsky could be structured as a Reverse Morris Trust (RMT), a transaction that allows a parent company to sell its subsidiary while avoiding a hefty tax bill. Alternatively, UTC may decide to sell Sikorsky outright to another company. Lockheed Martin Corp (LMT.N) and Boeing Co (BA.N) are among those that have expressed interest in a potential deal, and Airbus has said it is “watching with interest” to see what UTC will do in regard to placing the business unit on the market. All of this is occurring in light of a soft helicopter market (both civil and military). 7. Cessna (@Cessna) received FAA type certification for its Citation Latitude mid-size business jet. Deliveries are expected to begin in Q3. First customer is NetJets (@NetJets) which has 150 on order. The Latitude is powered by two Pratt & Whitney Canada PW306D turbofan engines. Textron’s other new Citation, the super-midsize Longitude, is said to be undergoing a re-evaluation. Industry analysts think the company may either revamp the aircraft to make it larger or announce another aircraft, this time in the large cabin, long-range segment where there are currently no Citation products. Prior to the 2008 economic downturn, Cessna had announced plans to develop its first the large-cabin jet, the Columbus. The project was cancelled in 2009. If nothing else, the economic downturn made one thing very clear: no Wichita-based aircraft manufacturer had an aircraft in the large cabin segment yet this segment was the only one to prosper during the long recession. It remains to be seen if the implications of this phenomena got the attention of Cessna and the city of Wichita “the Air Capital of the World.” An announcement from Cessna is likely at the November NBAA meeting in Las Vegas. 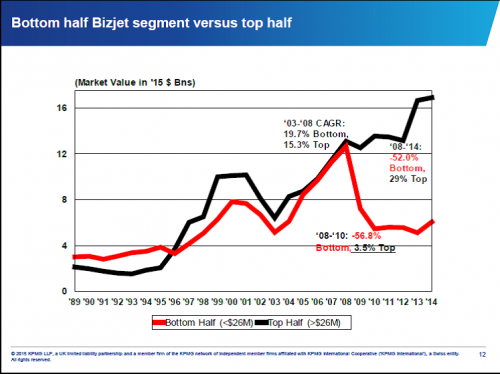 The bifurcation of the business jet market discussed above has been graphically illustrated by Richard Aboulafia of Teal Group in the chart below. First shown several years ago, the chart serves as a wakeup call to the business jet OEMs such as Cessna as to where the market has gone/is going at least in the near term. Cessna might conclude that it had better enter this segment before it is left completely behind by Gulfstream, Dassault and Bombardier. Deliveries of jets below the $26 million dollar price range suffered greatly during the recession, while more expensive, longer range, larger cabin jets barely skipped a beat. This phenomena was buoyed by demand from China and the Middle East and helped further by a weak US dollar. It is clear that an emerging global business jet market has been demanding larger, longer range jets while there remained a surfeit of smaller cabin, shorter range jets on the used aircraft market. While the gap may not remain this wide forever, it would be difficult to ignore the significance of this chart. 8. Speaking of long-range business jets, Dassault (@DassaultFalcon) rolled out its new, 5200 nm range, Falcon 5X on June 2. The Snecma Silvercrest powered aircraft is due for first flight this summer and entry into service in 2017. 9. Bloomberg is reporting that Embraer (@EmbraerSA) is considering closing its business jet factory in Harbin, China due to slumping demand. Orders for business jets in China have essentially stopped thanks to a government crackdown on corruption. The wealthy are lying low trying not to attract the attention of increasingly aggressive government investigators. 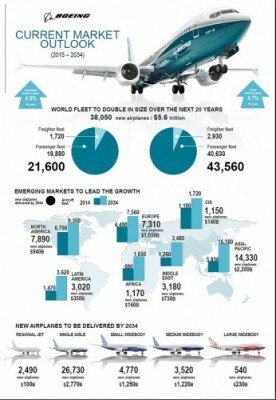 Embraer converted a plant that was used to build regional jets for Chinese airlines to building Legacy business jets but it has delivered just two aircraft so far this year according to an unnamed source quoted by Bloomberg. 10. Gulfstream (@GulfstreamAero), which recently announced that Mark Burns would take over as president from a retiring Larry Flynn, has announced that Derek Zimmerman will succeed Burns as president of the product support organization. Zimmerman joined Gulfstream in 2011 as VP of product support materials and later VP of customer support. He previously served as VP supply chain and aftermarket for Piper Aircraft and also managed the supply chain for Harley Davidson. Both Burns and Flynn served as president of product support prior to taking the reins of the whole company. 12. StandardAero’s airlines and fleets business unit has appointed Rob Despins to the new position of field service director following a reorganization of the division. The field services unit offers onsite MRO service and AOG support including engine MRO, logistics and reliability monitoring. Despins reports to Rob Higby, VP of sales and marketing for airlines and fleets services. 14. 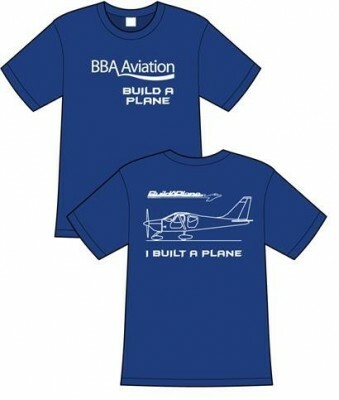 BBA Aviation is a supporter of the annual GAMA Build-A-Plane design challenge. The nationwide competition is open to high school age students who use X-Plane software to design a plane of the future. The goal is to help students work as a team in developing their science, technology, engineering and math (STEM) skills. Of 74 participating schools, this year’s winning team is The Chef Homeschoolers from Cuba City, Wisconsin. The four students on the team are now enjoying their prize of a trip to the Glasair factory in Arlington, Washington where they will spend two weeks constructing a Sportsman aircraft as part of the company’s Two-Weeks to Taxi program. This is the third year of the competition. Thank you for reading the first posting of Air Intel, powered by Dallas Airmotive.